Mariana Prats’ flan was celebrated in her social circles and at all family functions. She always brought one with her to any lunch or dinner she was invited to, and it was the centerpiece for dessert at Thanksgiving dinner and the Christmas buffet. New Years’ Eve party: Flan. Roast pork backyard barbecue: Flan. Baby shower: Flan. Birthday Party: Birthday cake and a flan. Her own birthday party: Flan. Neighborhood block party: Flan. Parish priest invited to dinner: Flan. Pot luck: Flan. Someone’s anniversary: Flan. If she and Benito were invited to dinner, instead of a bottle of wine she brought flan. 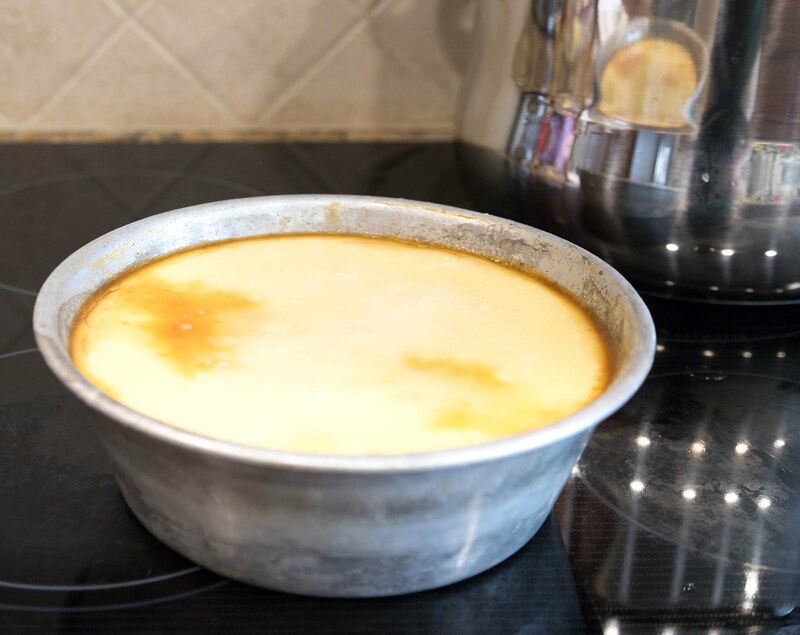 Cuban flan is a firm sweet egg custard covered with a caramelized sugar sauce. Mariana’s was always smooth and creamy and outrageously delicious. You could not have enough of her flan. Lactose-intolerant people ignored their malady and enjoyed her flan. Calorie counters stopped counting and went back for seconds. The problem was that you had to be quick or there would not be any left. She always rationed her flan. If she didn’t folks would cut huge chunks and there would not be enough to go around. She would bring it to the party in its mold, along with large plate and unmold it after dinner. Immediately after unmolding it she would slice it into small wedges, no more than ¾ of an inch thick, and start loading up serving plates, finishing each with a teaspoon of the caramelized sauce that poured out of the mold when she unmolded it. Her secret for a perfect flan: the pressure cooker. When you do her recipe in the oven it does not come out as creamy and it's easy to overcook it. Her other unique twist that I think adds to the creaminess is to use a tall mold. These are hard to find. 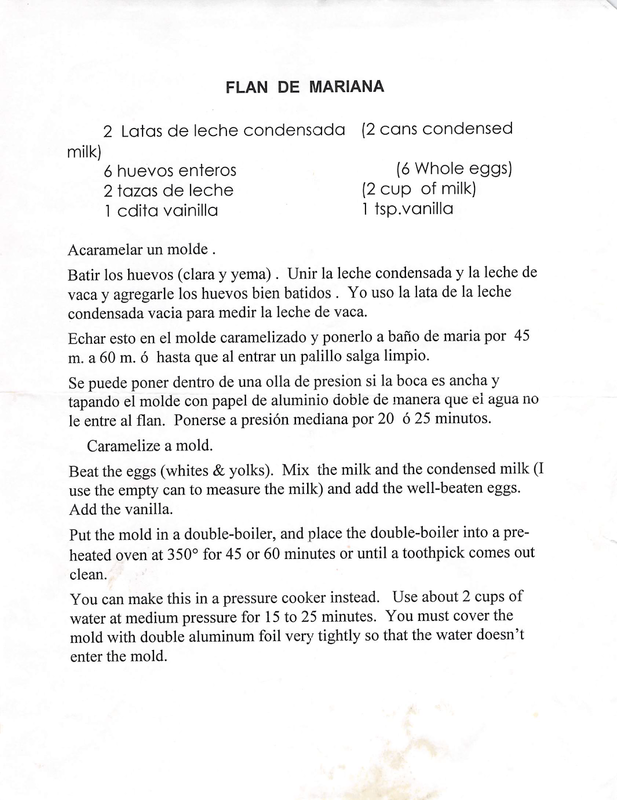 This is from the recipe she typed up herself, on Benito’s computer using Microsoft Works in the late 1990s. That’s right, Works, not Word — Microsoft’s word processor for the home that has not been supported since the turn of the century. I had a devil of a time finding her recipe in my hard drive because Windows does not index Works documents anymore. You’ll find an image of her original recipe below. She printed it and handed it out to anyone who asked. The recipe she typed up. Caramelize the mold. This means putting all the sugar in the mold and, with potholders, holding the mold over a flame or electric burner until the sugar melts and turns caramel-colored. You have to be very careful because if you get any melted sugar on you it will mean a trip to the emergency room. Away from the heat carefully rock and rotate the mold to bring the caramelized sugar up its sides. Set the mold aside to cool. Beat the eggs in a bowl with an electric mixer. 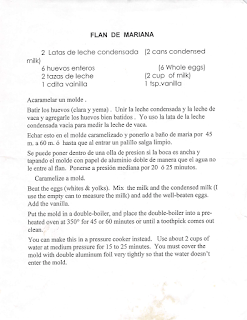 In a larger bowl mix the sweetened condensed milk and an equal amount of whole milk. Use one of the cans to measure the whole milk. Add the well-beaten eggs. Add the vanilla. Mix. Pour the mixture into the caramelized mold. 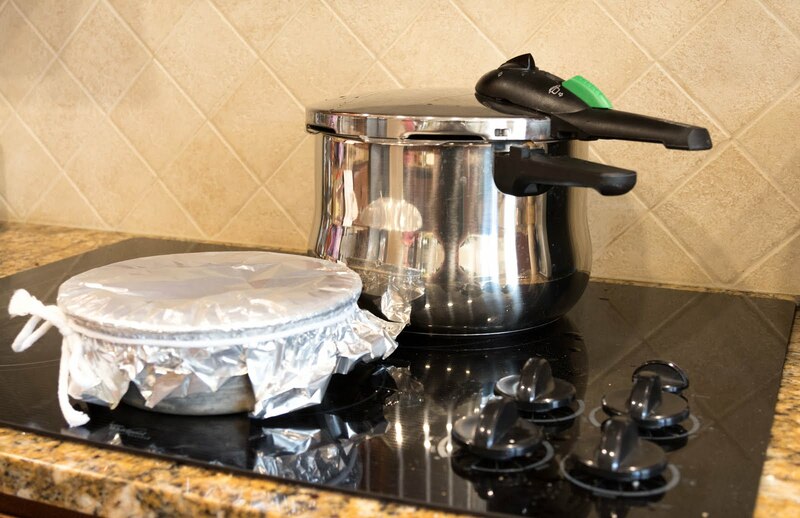 Pressure cooker: Cover the mold with two layers of aluminum foil and tie with string under the lip of the mold to form a tight seal so water does not enter the mold. If your mold is a tight fit for the pot, use more string to make a pair of perpendicular lifting loops. Put 2 cups of water in the pressure cooker and carefully lower the mold into the water. If you use a tall mold, cook at medium pressure for 15 to 25 minutes. In her mold she cooked it for 22 minutes after pressure was achieved. Release the pressure immediately by running cold water over the pressure cooker until the lid lock releases, and then carefully remove the hot mold from the pot. Resist unwrapping it right away. It will seem to be under-cooked if you do, but it will continue to cook and set all by itself in about an hour if you don't unwrap it. Oven: Preheat oven to 350° F. Do not cover the mold with foil. Prepare a bain-marie by filling a pan with hot water. Place pan of water on the center rack and lower the mold into it. Bake for 45 to 60 minutes or until a wood toothpick comes out clean. Carefully remove the mold. Let flan cool in the mold for a couple of hours, then refrigerate in the mold, covered, until it’s time to serve. To unmold: Choose a lipped fountain plate large enough to contain the caramelized sauce that will come out of the mold. Uncover the mold and run a sharp knife around the edge. Place the plate on top of the mold and flip over quickly and smoothly, then lift off the mold slowly so you don't spill the sauce. Serve at room temperature, although it is also delicious cold from the refrigerator. You can refrigerate the cooked flan overnight in its mold, covered with aluminum foil. Leftovers can be refrigerated for weeks, but there will probably not be any left.